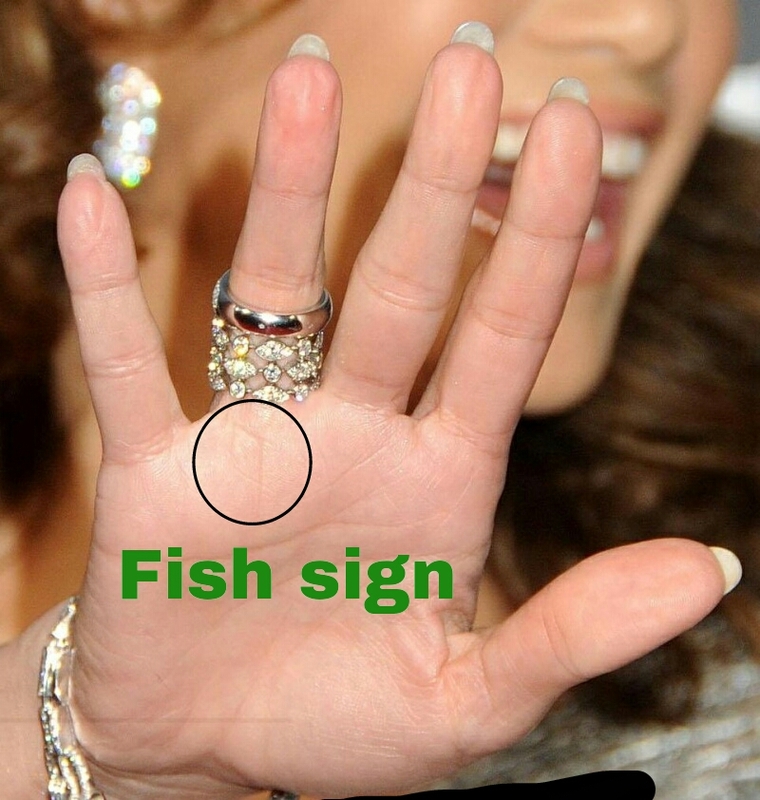 Here you can see the well marked fish sign on the jennifer lopez's sun mount. can anyone post her clear left hand picture. It looks like both depending on which country you come from. That is very interesting ; Fish changes to Diamond based on country. In case of a fish, it should be a conical shape at both ends. This one is more like a rectangle. Nevertheless, as much as she was lucky, this can be one of the indicators. I have a similar sign on my hand, but still to see the same colors in life as Jenniffer. Poor me. That is very interesting. To me it definitely looks Diamond. Fish is something different and I agree with Seawaves. Diamond and Fish are usually references found in Indian Palmistry and both are good indications. Sari wrote: It looks like both depending on which country you come from. The reason I said can be both, because in places such as India, symbols are used, but generally in Western or modern palmistry, symbols do not mean a thing, simply lines forming a triangle etc. To me, that is two Apollo lines with one girdle of Venus cutting thru it, and the other an obstacle line or second partial girdle of venus. Unless the palm print is clear and full palm print is posted it is difficult to find confirmation. I always reason that if there is one good indication in the palm it should have confirmation elsewhere in the palm to show which direction the person will get success. So without checking the full palm print it is difficult to comment further. Sari wrote: The reason I said can be both, because in places such as India, symbols are used, but generally in Western or modern palmistry, symbols do not mean a thing, simply lines forming a triangle etc.